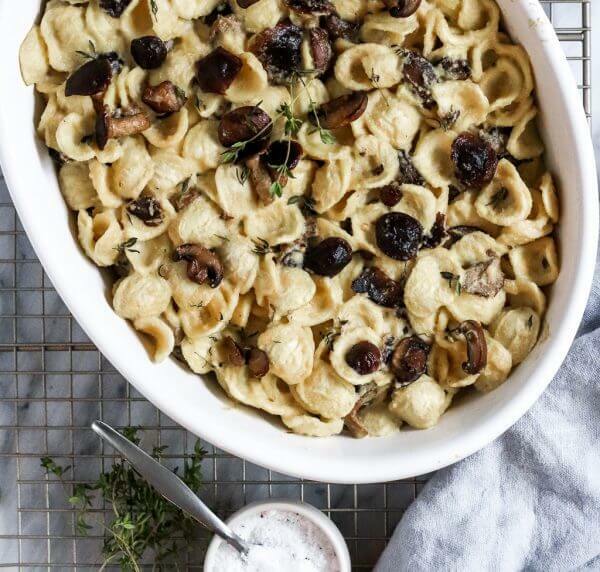 Are you ready for the creamiest vegan pasta dish filled with buttery sautéed mushrooms and fresh thyme? If you said yes, then I can’t wait for you to try this Creamy Vegan Truffle & Mushroom Pasta! There is just something SOOO comforting about creamy pasta dishes. Maybe it’s because it reminds me of mac and cheese, which reminds me of childhood. Okay, okay let’s be honest. My childhood was filled with some pretty yellow looking Kraft, or my personal favorite, the side of my Kids Cuisine dinner. Was anyone else obsessed with those? Only Me? I literally looked forward to nights my parents went out because it meant I could microwave my frozen meal that contained not only mac and cheese, but also corn, pudding, and chicken nuggets. How did those even cook at the same temperature?? Needless to say, my tastes have changed just a bit since those days. Most revolutionary for me was one of the first times I had Truffle Mac and Cheese. I was in LOVE ( a common theme with me and food). I am not sure how you even describe the taste of truffles and how perfectly they mesh with cheese, but to me, truffle and cheese is the new peanut butter and jelly. Back in January, my friend Jen and I went fully Vegan for 30 days. Though I have been a vegetarian for over 10 years now, it was eye-opening to see how many amazing delicious recipes I could make without cheese or butter. I’ve tried a ton of “vegan cheese” recipes out there, but none were quite as decadent as what I was looking for to put into a pasta sauce. So, true to form, I decided it was time to make my own creamy, mushroom-filled, truffle lover pasta sauce. Now I will say, in order for this recipe to taste really, really extravagant, you are going to need some high-quality truffle oil and (ideally) some really awesome truffle salt. However, once you grab that- this recipe is so simple, and actually tastes just as amazing for leftovers the next day! 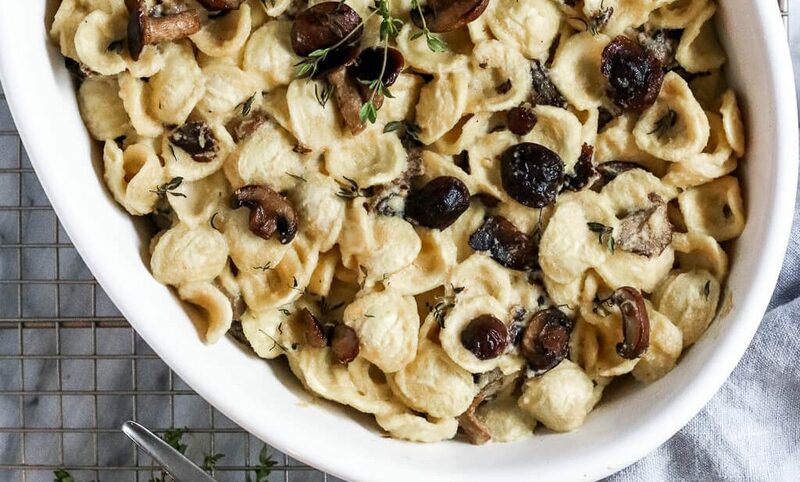 I decided to make this recipe with my favorite pasta out there- orecchiette- which I love because it look super fancy, tastes homemade, and, in my honest opinion, holds pasta sauce just as well as the traditional macaroni noodle. Before starting don't forget to soak your cashews for at least 2 hours, though around 6-8 is better! Cook your pasta according to instructions on the package. Once cooked, strain and set aside. While pasta is cooking, blend your soaked cashews, nutritional yeast, garlic, and truffle oil until a thick paste is formed. Once blended, add salt and water and blend until the paste turns into a thick, creamy sauce. Once your sauce is ready, add the vegan butter to a frying pan. Once the butter begins to sizzle, add in the mushrooms, lemon juice, and garlic powder and cook until there is no liquid and mushrooms are beginning to brown. At the end, add salt to your liking. Turn off the heat and top with fresh Thyme and 1 tsp truffle oil to coat. Add Mushrooms, Sauce, and Pasta to a serving dish and mix. Top with additional Fresh Thyme/Truffle Oil and Enjoy!